Where citrus trees once filled Belvedere’s Orangerie with colour, it’s now international art that brightens the building. 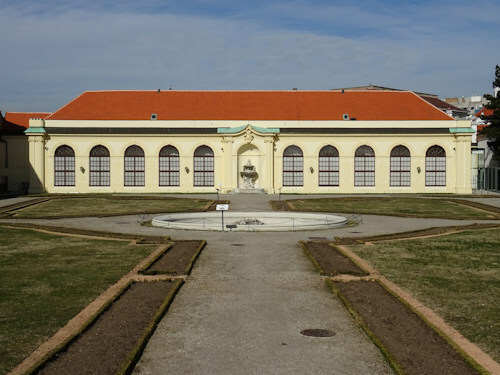 The long Orangery (German: Orangerie) outbuilding at the bottom of Belvedere’s privy garden was an architectural marvel when first completed in 1714. It had a removable roof and façade, which meant it could house, for example, citrus trees all year round. That’s quite a feat in a country than can have 35° in summer and -15° in winter. If Prince Eugene’s house guests weren’t impressed by the baroque majesty of Belvedere’s palaces, they could at least be suitably blown away by the botanical majesty of the host’s plants. (And if that failed, there was also a private zoo). Inside today’s Orangery is a modern museum gallery showing a temporary art exhibition. This means you won’t actually find any orange trees – there is little left to see of the original interior and the Orangery was rebuilt after the death of Prince Eugene, anyway. But…there’s a windowed corridor running down one side of the building. Standing at the main entrance end of this corridor gives you views across the privy gardens and out to Upper Belvedere palace (unless the blinds are down). If you don’t look too carefully left or right, that view pretty much takes you back to the 18th century: it’s just gardens and façades – no cars, satellite dishes or pylons to tear you back into the 21st century. Which is also why you need to stand at the main entrance end to see the view. If you go a little further down the corridor, then the A1 telecommunication tower pops into view on the skyline (“intolerable” as Prince Eugene might have said, before dispatching a unit of cannon to bring down the eyesore). For a nice view of the Orangery itself, simply go into the adjoining gardens, walk up to the first terrace and look back down. Any ticket giving access to Lower Belvedere includes entrance to the temporary exhibition. A glass corridor takes you from the end of one wing of Lower Belvedere Palace along to the Orangerie. You can also enter via the privy garden (which is itself only accessible, however, from inside Lower Belvedere). Follow the directions for Lower Belvedere.